Wash the jar(s) in warm soapy water and then submerge in boiling water until you’re ready to fill them up with jam. Approximately five minutes before you’re ready to seal the jars, warm the lids in hot (but not boiling) water to sterilize and to warm the rubber seal. Always use new lids for your jars. Old ones are unlikely to seal properly. This also means that you should not try cutting down on the amount of sugar in the recipe as sugar is the preservative (its not like you could just stick fresh fruit in a jar and put it in your pantry for a few months). 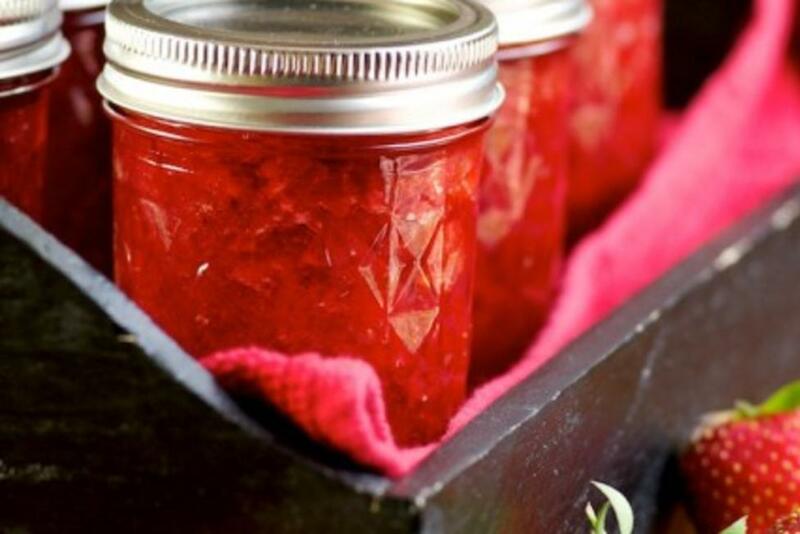 With all of that out of the way, the actual jam-making is simple. Wash, hull, and chop the strawberries. In a saucepan, heat these (crushing the strawberries a bit) as well as the lemon juice. Stir in the pectin and bring the mixture to a full rolling boil over high heat, stirring constantly. Add all of the sugar and stir it to dissolve. Allow the mixture to return to a full rolling boil and let it boil hard (without bubbling over) for one minute, stirring constantly. Remove from heat and skim off the foam if necessary (its purely aesthetic–it will cloud your final product). Finally, all that remains is to ladle the cooked jam into the jars. With some tongs, get your jars out of the boiling water, fill so there’s about 1/4 inch of head-room, wipe the mouth of the jar, and carefully put the lid on. Once all of your jars are sealed up, return them to the boiling water for 10 minutes. Finally, you can remove these and let them cool on your counter-top. The lids should form a good seal within the coming 24 hours (probably sooner), meaning that the center of the lid will not flex. If it does, get the jar in the fridge and use it soon as it is perishable. Otherwise, feel free to put these jars in your pantry and enjoy in the months to come (but once opened, store in the fridge). Enjoy!